I'd like to share a story of just one of the many kind gestures that has been bestowed upon World Vets. Alex, Nancy and Sarah Sherertz have been loyal supporters and volunteers of our organization from the beginning. On a recent trip to Peru, they came across some cute and very unique finger puppets which they bought for World Vets. Having been on projects with us in the past (Belize and Mexico)they knew that local kids are always a part of our programs. On their return, Nancy packaged up the puppets and shipped them and as luck would have it they arrived the day before our departure to Nicaragua. I made room in one of our medical supply duffels and the finger puppets were off on another travel adventure. The fact that they were small and lightweight made them perfect for the journey. During our clinic in barrio Las Delicios Nicaragua, each kid who brought in an animal for surgery or consultation got to choose a finger puppet for their very own. It was a serious job picking just the right one as they were all unique and unlike anything they had seen before. For children who have so little, I suspect this small gesture will not be soon forgotten. The finger puppets travelled from Peru, to Maryland, to North Dakota and finally to the homes of children in Nicaragua. Thank you for your kind gesture, it was a big hit! 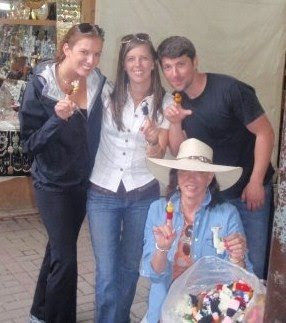 Alex, Sarah and Nancy Sherertz and Evan Hansen pose for a picture in Aguas Calientes Peru modeling the finger puppets they bought for World Vets. A few of the lucky kids in Nicaragua who were thrilled to receive the finger puppets on our project last week. Team heads out for Granada Nicaragua today!